Pondicherry or, as it is sometimes knows, Puducherry, is not all about butterscotch-coloured walls and fusion cuisines born from an amalgamation of French and South Indian flavours. From surfing and scuba diving to spiritual temples and elephant adventures, we explore everything this varied and exciting town has to offer. This 500 year old temple is an extraordinary piece of architecture, featuring a rare statue of Ganesh with three legs atop a tower made entirely of gold. With frequent festivals taking place, Sri Manakula Vinayanagar Temple is a must-visit to experience the true dynamism of Hinduism. Visitors to the temples also have the opportunity to be blessed by an elephant that joyfully touches its trunk on the head of every visitor that comes to greet it. Sometimes, Pondicherry can become a little too elegant and quiet; when that happens, the Grand Bazaar comes to the rescue. The Grand Bazaar is a spectrum of color, sounds and scents, offering such varied items as flashy clothes, idols, vegetables, flower garlands and an energetic fish market. With so much ongoing activity in this busy market, it is a treat for the senses to absorb the haggling of the vendors and attractive piles of produce to draw in their visitors. It is hard to miss out the chocolate-coloured grandeur of the Sacred Heart Basilica, that is gracefully seated in the South Boulevard of Pondicherry. The Gothic architectural design of the church is a marvel to look at; unlike the broody aesthetic of typical Gothic architecture, the Sacred Heart Basilica is all but covered with warm browns and and whites elegantly placed side by side. It is one of the top pilgrimage spot for Christians in India, and is built in a cross shape. The Kallialay Surf School was born out of a passion for surfing by two brothers who moved to Auroville near Pondicherry at the ages of nine and ten. 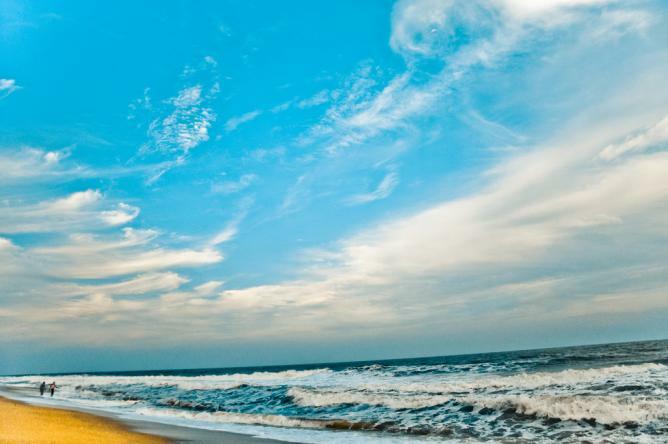 Apart from boating, the Pondicherry beaches are a superb place to surf, and for visitors who want a great learning experience on the waves, there is none better than the Kallialay Surf School. As well as simple beginners courses, the school also offers weekend packages and surf board rentals for the more experiences. The Boutique d’Auroville at the Auroville Visitors Centre is a treasure house of everything which Auroville has to offer, ranging from traditionally made Auroville handicrafts, clothing, tableware, jewellery, furnishings, aromatherapy to a variety of organic herbal syrups and dried fruits that are custom made in Auroville and emblematic of the area’s culinary culture. Pondicherry features the second largest mangrove forest in the world. Located in Pichavaram at Chidambaram, the mangrove forests are must-visit to marvel at the intricate shapes and pathways created by the plants and their roots. With the high content of salt and low oxygen levels in the water, the Pichavaram mangrove forest has a perfect environment to grow and thrive. The most remarkable aspect of visiting the Pichavaram mangrove forest is the charming boat ride that takes a tour around the forest, allowing visitors to get rare, up close glimpses of the trees. Sri Aurobindo Ashram is a small, spiritual community named for and set up by Sri Aurobindo, the revolutionist who left politics and turned into a spiritual leader after a moment of Enlightenment. The Ashram aims to help people see within themselves and surrender themselves to a higher spiritual power, offering yoga and meditation practices, as well as a number of publications. This Hindu temple is both a popular tourist and pilgrimage site. It is dedicated to the god Ganesa and was built before Puducherry came under French occupation. On the southern side wall, the temple holds three rows of god sculptures and stone engravings. On feast days, devotees pull a golden chariot, the building of which was funded purely by donations. The chariot required 7.5kg of gold to be built. There is nothing quite like visiting a pocket-friendly museum established right beside a beach. The Puducherry Museum takes visitors on a historical and geographical ride around Pondicherry and its cultural heritage. The main attraction of the Puducherry Museum is the grand map they have that depicts the evolution of world cultures, as well as numerous staues, arikanmedu artefacts and furniture from the city’s French era. Temple Adventures in South India’s only PADI certified diving centre. There is a group of skilled trainers who organise deep sea diving, surfing and snorkelling sessions in Pondicherry, very popular activities among tourists. Temple Adventures is a must-visit for travellers who are looking for a more adventurous and nature-focused experience of India.